Dario Cueto and Konnan met prior to the first match, with Konnan explaining he’d brought the three top young talents from Mexico: Drago, Fenix, and Pentagon Jr. (Dario asked if there were visa problems, Konnan said they were cleared up.) Dario booked them in a three way match to prove who was best. Dario came to the ring and mocked complaints that there weren’t enough lucha. He introduced Mariachi Loco as working at the Mexican restaurant down the street (with his band!) and would perform if he won. He did not win. 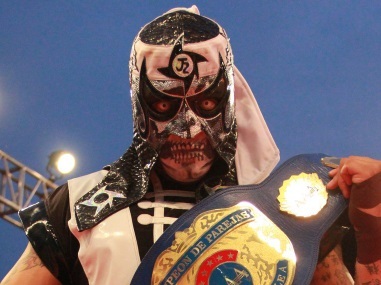 Sagrada was introduced as part of Lucha Underground’s open door policy – anyone who shows up can fight. Sagrada won cleanly, but was attacked and laid out by Chavo. A sit down interview with Vampiro and Chavo explained Chavo’s turn – he’s sick of playing the nice legacy carrier, he’s doing it his way now, and he thinks Blue Demon Jr. is just a famous name who’s never actually been any good. Mil Muerte’s backstory was explained: he’s Pascual Mendoza, his family were all killed in the 1985 Mexico City earthquake when he was a kid and the stone is from the wreckage. He’d like revenge on the world. Another Prince Puma vignette was shown. Fenix and Pentagon and Drago were awesome – classic situation where they all got over, though Fenix was slightly pushed above the other two. Of all the shows where I was indirectly referenced in the first segment, this was my favorite. Fenix, Pentagon and Drago knocked it out of the park in their debut. That first minute would’ve been good enough, but they kept turning up the gas to the end and everyone looked like superman. Fenix’s stage dive looked crazy, especially since that’s the first we’ve seen anyone use the Temple in that sort of way. A lot of the spots would look familiar to people who’ve followed them in Mexico, but they all looked great and the finish was perfect. Fenix won but all three guys were made by the match, and it’s just a matter of following up on it. It looks like they do. Either Striker hadn’t seen a lot of these guys before or did a good job pretending they were knew, because he was totally (and pleasantly) caught off guard at times. Mascarita looked good in his debut and they used him the right way: Mariachi got the better of him a lot, lost advantage when he didn’t take Sagrada seriously, and Sagrada used his speed to get the win. Crowd was into the character. The regulars from the last few shows didn’t have matches, but they did a lot of work on moving the characters a little bit forward a step. The Chavo interview was great, both in terms of getting over his character and in terms of appealing to this particular author. The Johnny Mundo skit was straight of those action movies he’s looking to film (though poor Cortez/Castro have been dropped pretty low on the totem pole already. Someone’s got to be on bottom.) They set up a match for next week and a mystery for down the line. The Mil Muertes backstory was creative and we got answers a lot quicker than I’d expect. This show is rolling on all cylinders right now. It’s not better than I thought it would be, it’s better than I thought it COULD be. Lluvia replaced Dark Angel. Tecnicas took 2/3, Estrellita pinning Zeuxis clean in the third – which somehow sets up Zeuxis getting a title shot. 6) Felino, Kráneo, Shocker b Blue Panther, Diamante Azul, Dragón Rojo Jr. Presumably everyone in the cage match knows they’re in and has been told just to challenge everyone else, because that’s the way it’s playing out. (That suggest someone’s actually worked this out in advance.) Felino’s my bet to lose the match hasn’t even been announced yet. Estrellita beating Zeuxis makes absolutely no sense. I’d be willing to believe a CMLL referee screwed up but the photo shows Estrellita using her signature backslide bridge-ish move and that’s usually the finish. A bit announcing talking point is how some wrestlers reach even greater heights after losing their masks. It seems to be a belief of the programming committee as well, because almost every main event feud the last two months has revolved around Ultimo Guerrero in some way. That’s probably why they’re doing a cage match – ultimo Guerrero is so hot (at least in their minds) they might as well taking advantage of it by putting his hair on the line already. The by product has been stale top of CMLL especially if you’re not interested in a billion Ultimo Guerrero singles matches. In possibly related news, CMLL is giving heavy promotion to a CMLL filled showed in Arena Olimpico Laguna this weekend. In the main event, Fenix, Drago and Pentagon Jr. fight each other; Mascarita Segrada and El Mariachi face off; after Chavo explains himself, Konnan warns him that Mexico is coming; Mil Muertes fights Ricky Mandell. All the matches are right there, no need to list them. This is episode 3, the one we’ve been holding out for since they taped it. The first two episodes have been significantly better than expected so it’s not as though this show needs to be a home run to save it or anything of the sort, but is the first big opportunity for Fenix, Pentagon and Drago to make a name for themselves in front of an English speaking audience. Everyone’s been super positive about this match and some of their ones to come, and I can’t wait to see it tonight. Segunda Caida reviews 07/06/14 CMLL on LATV and Ultimo Guerrero vs Hector Garza 01/22/2010. The Ingobernables, Puma, Niebla Roja, Polvora and Fuego are all listed as guests on today’s CMLL Informa show. That’s a lot of people. Poetico unmasked Drastico in Deportivo 11 de Julio (Pachuca), a rare case of an unmasked man beating a masked one in an apuesta match. Drastico is Ciristna Castro Garica. Mini Charly Manson plans on beating Dinastia and getting the minis title back. Hype for Sangre Azteca’s return. Mesias sells a nutritional product. it will be Super Nova’s mask vs Eterno’s hair or Golden Magic’s welterweight title versus Canis Lupus’s mask. Rayo de Jalisco 36th Anniversary show. No idea if that’s Sky Angel or a confusingly named new guy. why are there so many Shocker main events? Semimain and tercera look really good. 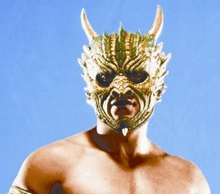 Dragon Lee has leaped to #1 in the “who will eventually unmask Kamaitachi sometime in spring 2015” power poll. La Mascara gets along with Super Porky, but does he get along with Titan? I dunno. Zeuxis seems like a 60/40 favorite in the title match. Just a hunch. I feel like I’ve seen some iteration of that tercera something like 20 times in the last two months. Is Marco going to be in the cage match?